In December, Cops for Kids with Cancer made a donation to Anna Jerome, a 14 year old from West Roxbury with leukemia. Anna went back to school in January but her leukemia has relapsed. Anna and her family are preparing for a bone marrow transplant. 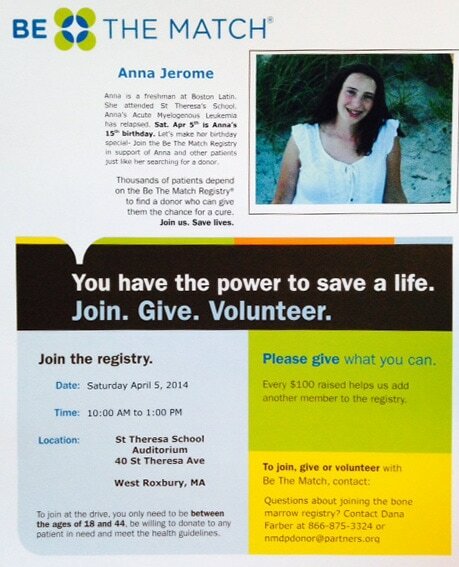 In honor of Anna’s 15th birthday, a “Be the Match” drive to identify prospective bone marrow donors for future patients will be held at St. Theresa’s School Auditorium on Saturday, April 5, from 10 AM to 1 PM. Donors should be between 18 and 44 yeas of age and willing to donate to any patient in need. “Be The Match” will also be accepting monetary donations, as they spend $100 for each donor they screen and add to registry.